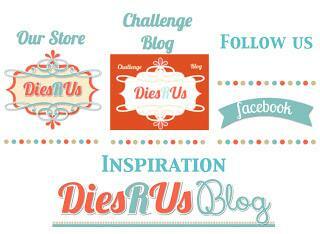 Hi, It's Lisa here today sharing with you my very first card for Dies R Us! I feel so lucky to be part of this new DT. Thanks you for picking me! 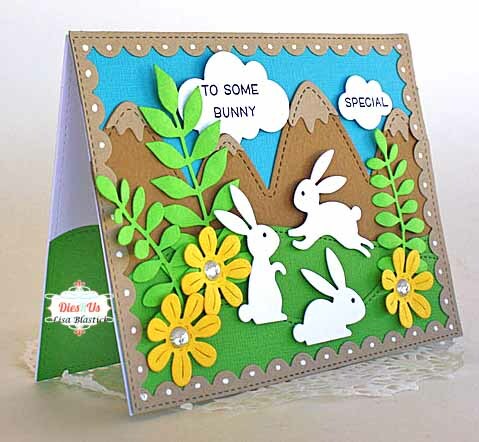 I wanted to share this fun, bright Spring/Easter themed card using several die cuts. I started off with a plain piece of white cardstock for the base. It is a A2 size card 4.25 x 5.5. Then I placed bight blue paper in the background. I layered two "stitched hillside borders" with "stitched mountain borders" On top of that I then placed the "reversed stitched rectangle" I doodled the white dots on the edges. The "simple puffy clouds" I placed my sentiment on....It has been my latest passion for sentiments. The "floral bouquet kit" has the beautiful leaves and cute flowers. I placed some bling in the center. Last but not least, are the adorable "bunnies" from Impression Obsession. It is the first time I used them on a project. I'm excited to use them again soon! The "stitched hillside border" is also in the inside too. I usually just glue down the edges but not the center. So I can place a gift card inside. 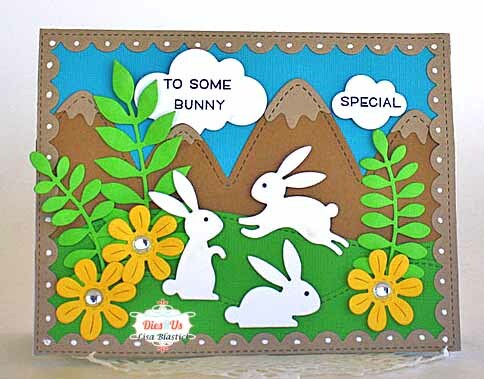 What an adorable Easter card! Love the little scene you created! 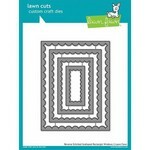 You used lots of awesome dies to make a fantastic scene card. Bravo! So sweet! And, like everyone else, I love the scene you created. OMG this is so adorable!!! GREAT JOB!